Last week we had our first snow. By many accounts, it was a long time coming. A certain 7-year-old boy that I’m intimately acquainted with mentioned it quite often, how long it was taking the clouds to let loose the fun stuff. Usually by mid-December, we’ve had several dustings of snow and maybe even some accumulation. This year, until last week, we’d only had lots of COLD, as I mentioned in an earlier blog post, but no snow. I told the sad, sad tale of how it was the absolutely most breathtaking snow ever, and how I had my little camera in my pocket, and how after one picture my camera spoke to me: “Change Battery Pack.” And how, a couple hours later, when I went back out, fully-charged battery loaded back into my camera, the magic was gone. The clumps of royal icing on all the weeds and the trees and bushes had, softly but surely, fallen in clumps onto the ground. And then, to make matters worse, we were stuck inside for a few days with a frustrated little Mack, who was ready to go out and try his new ice skates on our frozen pond NOW, and to sled down the hill, but whose Mama wouldn’t let him because it didn’t get above about 8° and that is just too cold for this Mama to go out and have fun. Or, sorry, to let anybody else have fun either, the old meany. Meany? Meanie? The old grouch. But. All was not lost. 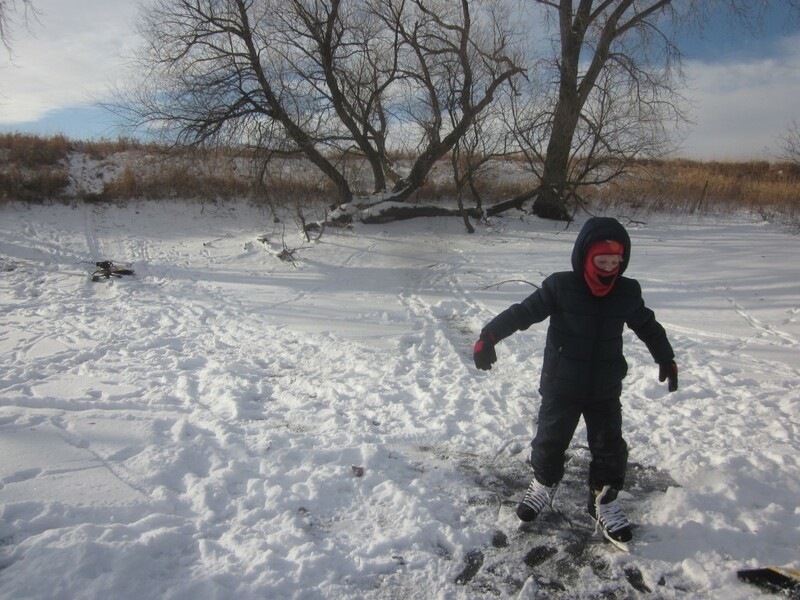 After a couple days of that bone-chilling cold, at least the pond was frozen solid enough to be safe–beyond a shadow of a doubt!--for skating and sledding across. So when the temperature rose just a little, a couple days later, Amalia and little Mack and I dressed up in our warmest clothes and trudged out. All that waiting was nearly more than my little son could stand. Before his sister and I had even pulled on our puffy winter clothing and then indulged in laughing at how silly each of us looked for a minute or two, and then struggled out the door, single-file because we were so puffy and wide with our parkas and snowsuits and many many layers, Mack had loaded sleds to the sliding hill–three of them, of course, so each of us would have one. 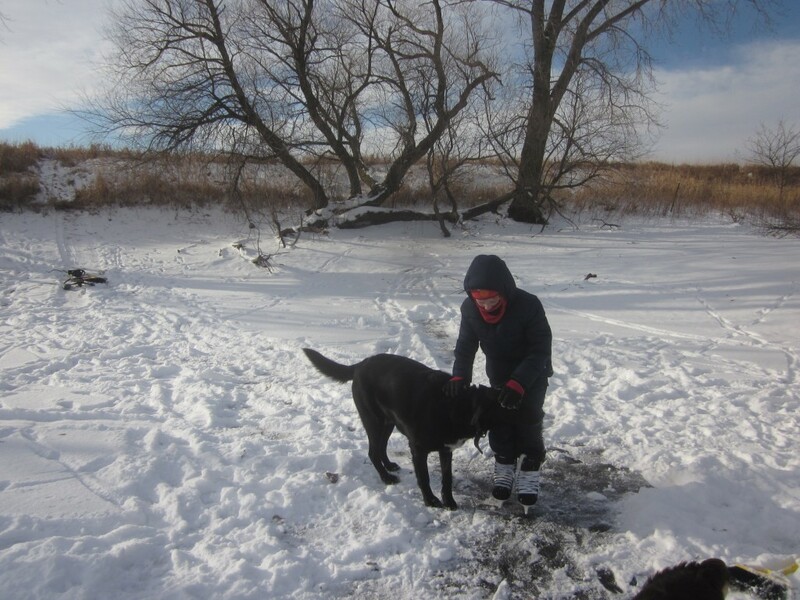 We don’t have big hills here on our place (hullo, it’s Nebraska) but we do have a couple that are big enough to satisfy a 7-year-old, his old mama and his sister, and his two giddy and constantly-in-the-way dogs. So we took a couple of rides down the hill, and we were just beginning to make a good sledding track in the deep snow, and then Mack remembered his new ice skates. “Mom! I’m going up to get my new ice skates!” But son, I reminded him, there’s six inches of snow on the pond! Can you skate in that much snow, I don’t think so. His face fell. “But I want to SKATE!” he said, promptly forgetting that he had desperately wanted to ride his SLED only moments before. “Okay!” he panted, and he took off, running back up the hill to the house, pumping his legs as quickly as he could, through the deep snow. Which, actually, wasn’t very fast. Now Gentle Readers, it wasn’t exactly a warm day. Although it was no longer 8°, I don’t think it was above about 18°. It was an improvement, but I knew that it wouldn’t be long before we were all going to be forced inside by the cold. I went to look. Sure enough. We looked at each other. “Got a knife on ya, Mom?” He asked. I shook my head. I moved my toes inside my boots. Yep. I could still feel them. Just–barely. Mack sighed and let out another, weaker, wail, and started the trek back up the hill to the house for a knife. A little slower this time. I resumed my sweeping. I stamped my feet. Shoot. My toes were beginning to numb. And that’s when the magic happened. Isn’t that the way it goes? You are doing something so ordinary, like, say, sweeping snow off the pond so your little boy can do some skating, while you slowly but inexorably lose all feeling in your fingers, toes, and the tip of your nose, and you are presented with something absolutely amazing. This was what was underneath the snow. 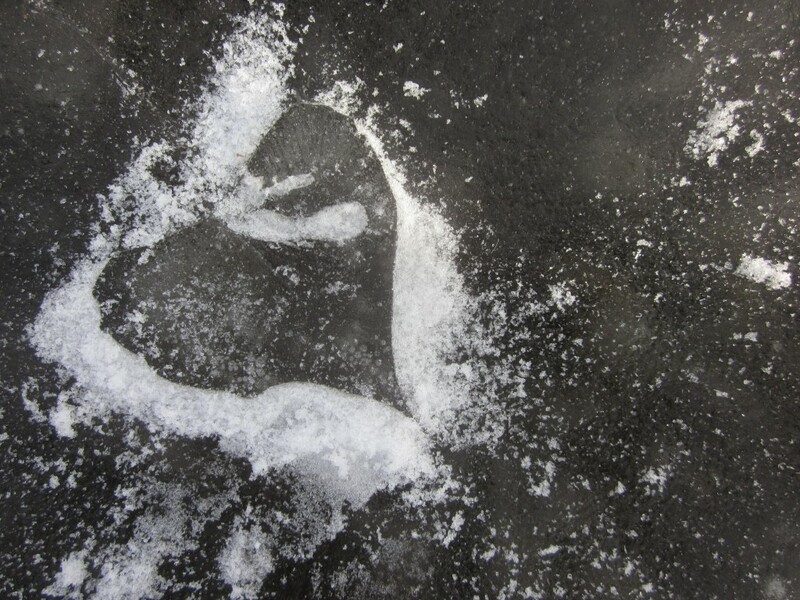 As I swept away the snow, a delightful discovery: the ice was dotted with little hearts! 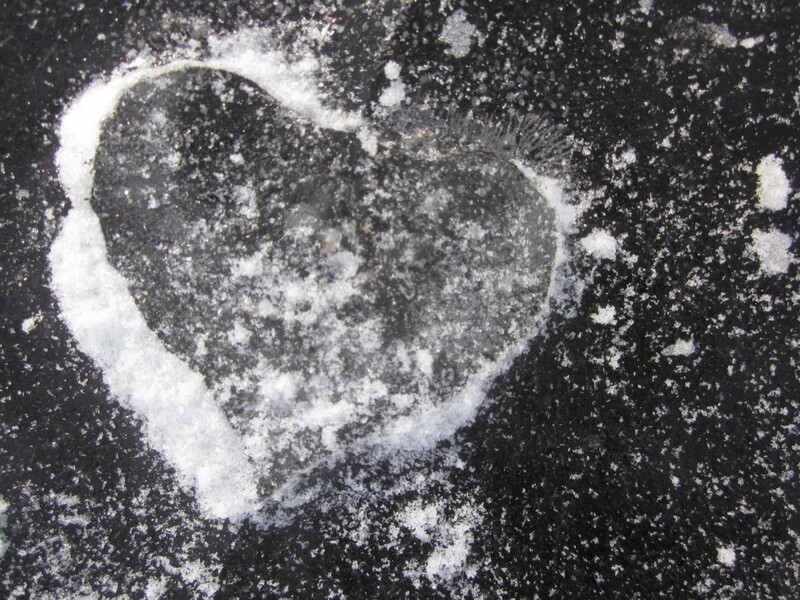 As I swept the snow away, just enough of it clung to the ice surrounding the hearts, outlining them beautifully. How was this happening? Where did the hearts come from? I felt a thrill go through me, at least through the parts of me that weren’t numb yet. I knew there was a logical explanation, but I felt as if it was a direct gift from God, for me, his humble servant, who was giving up the afternoon’s plans and slowly growing very cold indeed, in order to please my little boy. 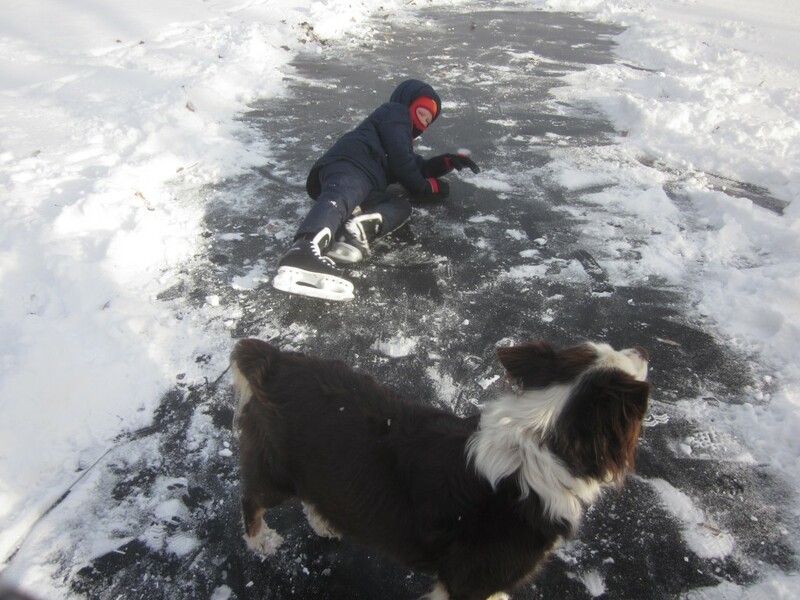 I was sweeping snow off the pond so Mack could indulge in his dream to ice-skate. I had Christmas shopping to do; the house was a mess; I had bills to pay and our play to work on; but I was down on the pond sweeping snow. Who does these things? Mamas do. And Papas do. Parents pull late nights and sacrifice countless moments to do good things for their children. They spend weekends at sports events, evenings at movies that they would never choose, countless hours shopping for just the right Christmas presents; they work more than one job to provide, and not for themselves. They do it for their children. Jesus said “Which of you, if your son asks for bread, will give him a stone?” In other words, if your son asks (and asks and asks) for you to help him learn how to ice skate, which of you will push him in front of the t.v. instead? Not this mama. Isaiah 43:4 says that I am precious in His sight. These hearts, for me, were just another visual reminder of that sweet fact. It may seem silly and simplistic to you, but God knows me so well: He knows that I am a visual person–He made me that way!–and that my delight-meter is very keen. 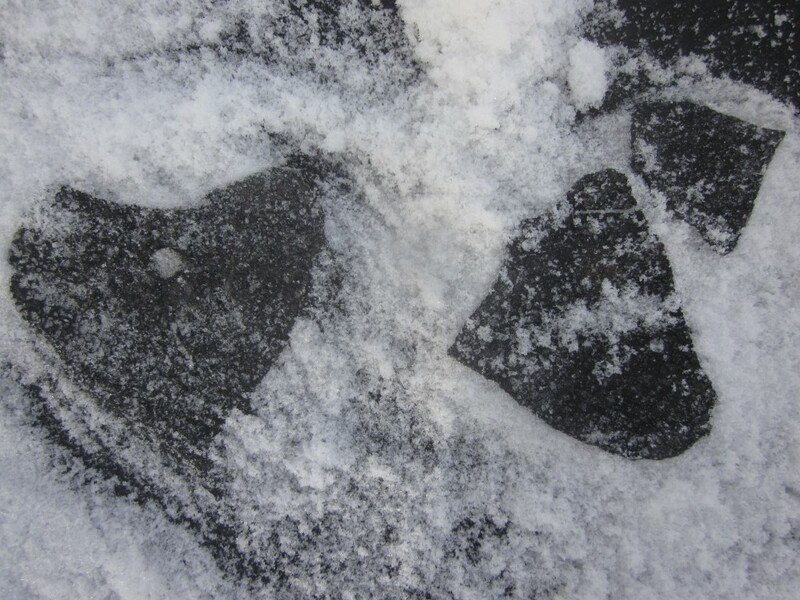 Finding these hearts beneath the snow sent it shooting up so high that the bell at the top was ringing away in my heart. I wanted to dance. It even almost warmed my toes and fingers. Almost. I screamed at Amalia to come look. I pulled numb fingers out of my mittens and took a few pictures. I said a prayer of praise and thanksgiving to God. He is so good to me! See? SEE?? Mysterious symbols of love! Pretty neat, huh? There are several cottonwood trees on our place, and most of them are growing near the pond. The leaves are heart shaped. So the leaves were lying on the pond as the pond froze. When I swept the leaves away, they left these raised, heart-shaped areas. The fluffy snow clung to the edges, making the most exquisite hearts. In all the years we’ve lived here, I’ve never seen this before. It’s a first. I could have walked around and swept and taken pictures and just enjoyed those hearts all afternoon, but Mack had gotten back with the knife, and he was waiting for me to help him with those skates. And yes, I was getting pretty cold. Here’s a question for you: why do they put so many holes and such long laces on skates, I ask you? By the time I had laced up the skates, Mack was harrumphing and sighing and chomping at the proverbial bit to just get out there and skate. And my fingers were dangerously cold. Finally . . . he clumped out to the path that I had swept, to try his hand at ice-skating. So to speak. I blew on my hands, trying to warm them up a bit. He didn’t do too badly on the ice, for a newbie. He clomped and slid and skated a bit. The dogs were no help. 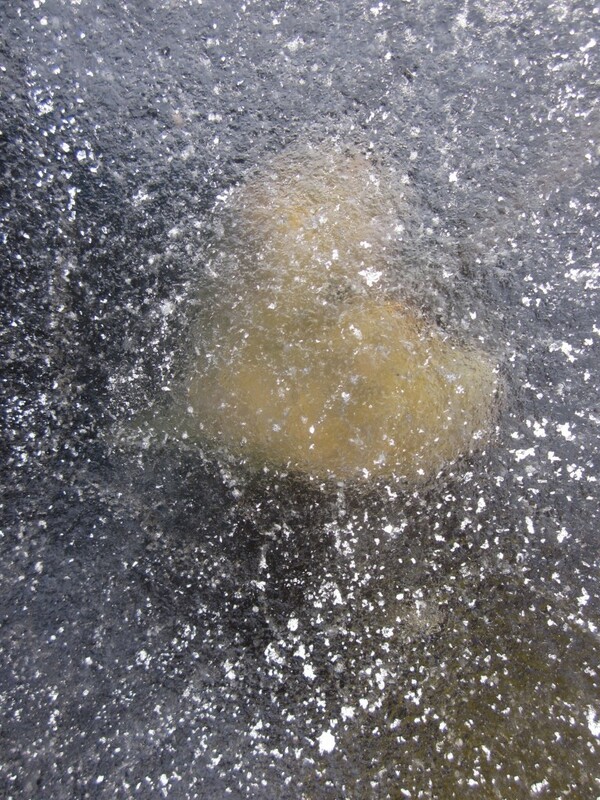 It was while he was lying on the ice the second time or so, when he took stock. “Mom, are you getting cold?” he asked. “Me, too. I think it’s time for hot chocolate, don’t you?” And just like that, the maiden ice-skating session was over. And that was exactly what it was time for. Hot chocolate. And a cozy-up to the wood stove in the living room. And perhaps a good book. Maybe that’s the best part of playing out in the snow and the ice. P.S. 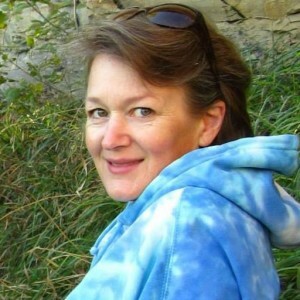 Hey, you all, I’m linking this post up with the kind and generous folks over at The Prairie Homestead’s weekly Blog Hop. Come join me over there! 1. Your inhibition of Mack reminded me of the thing that I remember most about my mom. Illogic- she is cold, ergo, I am cold. It is the primary reason I decided to never wear a coat when I got free. And, never have. And, no, I am not cold- not in MA, not in MI, not even in MN. 2. I am thrilled that you managed to recharge the camera to show us those heart shaped photos. I recalled the scenes we had with similar bizarre shapes for about the same reasons. Thanks for rekindling those memories. THanks for your kind words, Roy. I’ve always thought that it was a blessing that God made kids so CUTE and fascinating, that you’ll bear quite a lot in order to spend time with them! I love reading about your adventures Amy 🙂 How beautiful are the snow hearts? Aww ! It’s a sign/ message! I thought they were pretty awesome, too, Sophie! Very cool Amy. I haven’t seen snow yet in my area. I like the comment you made about the dogs… “They were no help”. Lol. I’m sure they just looked on and went about their business, haha. Great post Amy! Thank you Nate! Where are you from, that you haven’t had snow yet? How cool was this post? (Ok, cold). I pinned it. 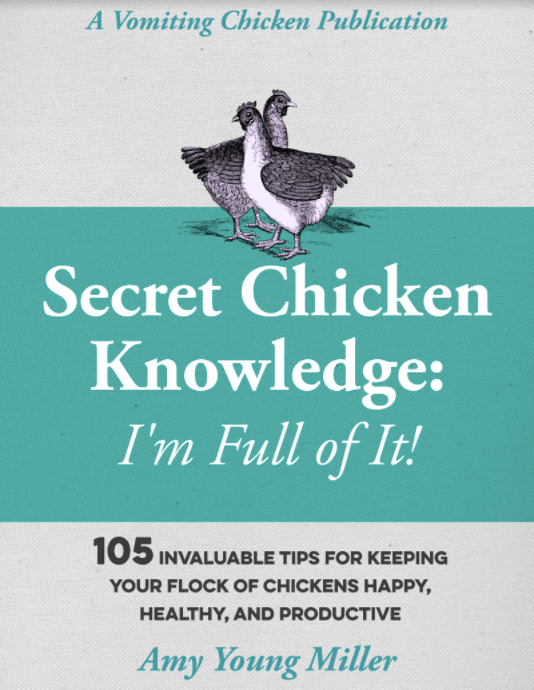 I’ll be tweeting it. It is so heartwarming…er, heart cooling. Roy is so right about the wonder of what our children remember. You have grown children, so you know that already- I’m finding that out with my 23 year old now. And he will remember your love most of all. Brrrr…. Brings back some memories though. Growing up in NJ it would be cold but not always so much that pond skating was safe. The fire dept would flood baseball fields and let it freeze. Wonderful pictures! Love this post. I am sharing with a farm friend of mine. Hope you are keeping warm this winter.